Several character and paragraph type settings are located in the Photoshop Elements 11 Tool Options. These options enable you to specify the type and pair it with your images. Font Style: Some font families have additional styles, such as light or semi-bold. And other styles are assigned as separate typefaces. Only the styles available for a particular font appear in the list. The font style also supports a WYSIWYG menu. If a font you want to use doesn’t offer bold or italic styles, you can simulate either (or both) by selecting a faux style in the Tool Options (T icons). Font Size: Select your type size from the drop-down list or just type a size in the text box. Generally, text sizes are shown in points, with 72 points equaling approximately 1 inch. If you don’t like points, you can switch to millimeters or pixels by choosing Edit→Preferences→Units and Rulers (or Adobe Photoshop Elements Editor→Preferences→Units & Rulers on the Mac). Leading: Leading (pronounced “ledding”) is the amount of space between the baselines of lines of type, usually measured in points. The baseline is the imaginary line on which a line of type rests. You can select a specific amount of leading or allow Elements to determine the amount automatically by choosing Auto. When you select Auto Leading, Elements multiplies the type size by a value of 120 percent to calculate the leading size. Therefore, Elements spaces the baselines of 10-point type 12 points apart. Elements adds that extra 20 percent so that the bottoms of the lowest letters don’t “hook” onto the tops of the tallest letters on the line below them. Wider line spacing can make text easier to read (as long as you don’t go overboard!) or provide an artistic effect. Tighter line spacing makes for more compact text but can decrease readability if the tightening goes too far. Text Alignment: Choose an option to align horizontal text on the left, center, or right. Left-aligned text is even with the left margin and allowed to be ragged on the right side of the column. Centered text is evenly centered in its column and ragged on both right and left edges. Right-aligned text is even with the right margin and allowed to be ragged on the left side. If you happen to have vertical text, these options rotate 90 degrees clockwise and change into top, bottom, and center vertical settings. 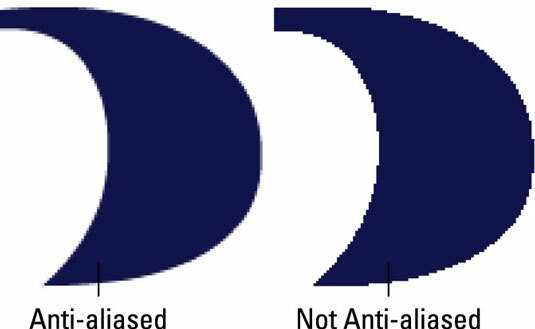 Anti-aliasing: Select Anti-aliasing to smooth the edges of your text slightly. Anti-aliasing softens that edge by 1 pixel. For the most part, you should keep this option turned on. The only occasion when you may want it turned off is when you’re creating small type to display onscreen, such as on web pages. The soft edges can sometimes be tough to read easily. Faux Bold: Use this option to create a fake bold style when a real bold style (which you’d choose under Font Style) doesn’t exist. Be aware that applying faux styles can distort the proportions of a font. You should try to use fonts with real styles, and if they don’t exist — oh, well. Faux Italic: This option creates a phony oblique style and carries the same warning as the Faux Bold option. Strikethrough: Choose this option to apply a strikethrough style to your text. In legal applications, strikethrough is widely used to show sections that have been removed, in their original context. Style: Select a type layer in the Layers panel and then choose a style from the drop-down list. Choose from simple styles (such as shadows and bevels) to complex ones (such as glass and plastic effects). Note that this option is accessible after you have committed your type. Change the Text Orientation: Select your type layer in the Layers panel and then click this option to switch between vertical and horizontal type orientations. Create Warped Text: This option lets you warp and bend text by using 15 different types of distortion.